Riolu & Lucario by Pokémon, Nintendo, Game Freak. That was me with my dad when i were younger. me:tell me what happened to riolu? Funny, but also cute, especially Riolu crying. Every older sibling has been in this situation. *poilce siren and lucario cops jump at lucario start to beating with with bone rush shouting* STAP RIGHT THERE!!! YOU'LL NEVER TAKE ME ALIVE!!!!! Da hell did u do to ya, Lucario? 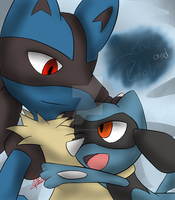 Lucario, you're being rough on Riolu. Bonding between brothers ends with and epic fail. Oh, Lucario you screwed up what is wrong with you please be good to your brother. Lucario!! What have I told you about not hitting your little brother!! : But he LITERALLY asked for it! You cannot fault me on that! Riolu, just be glad you aren't Krillin. Kakarrot once punched him so hard that he flew through a forest, blasted through someone's house, bounced off of a barn, and collided face-first with a large rock. And the worst he got was a black eye. Give the guy props. I remember I asked my elder brother to hit me and this happened. Like serious or a expersion? But now I'm stronger than him.